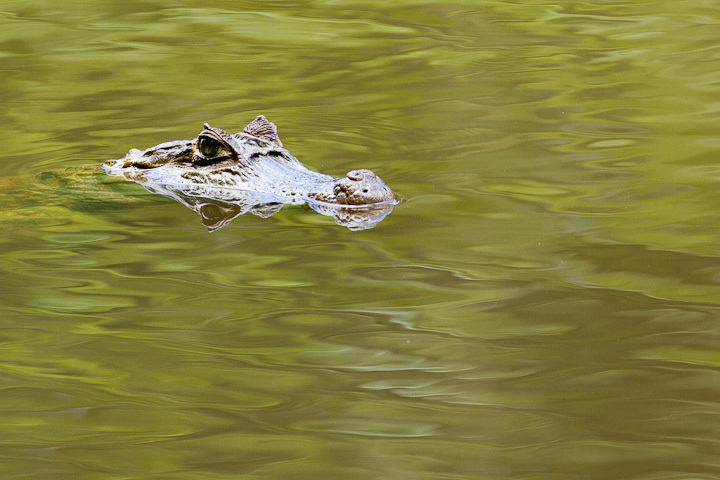 On my trip to Guyana, I was not only on the lookout for birds, but also their relatives, the crocodilians. 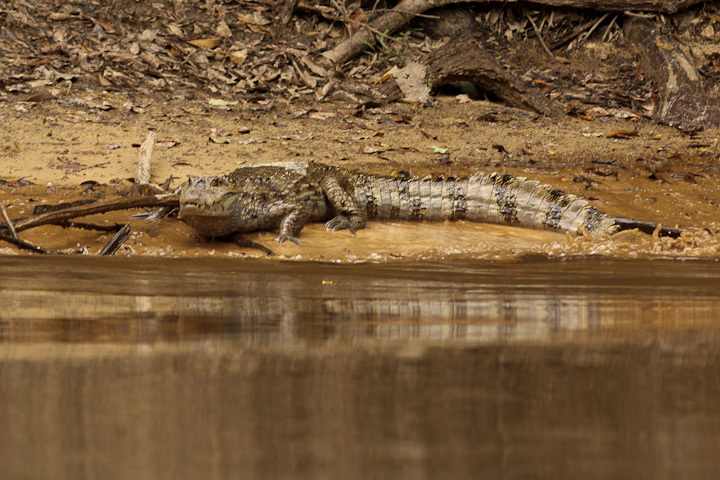 Guyana is home to 4 species of caiman, including the largest and smallest species in the world. 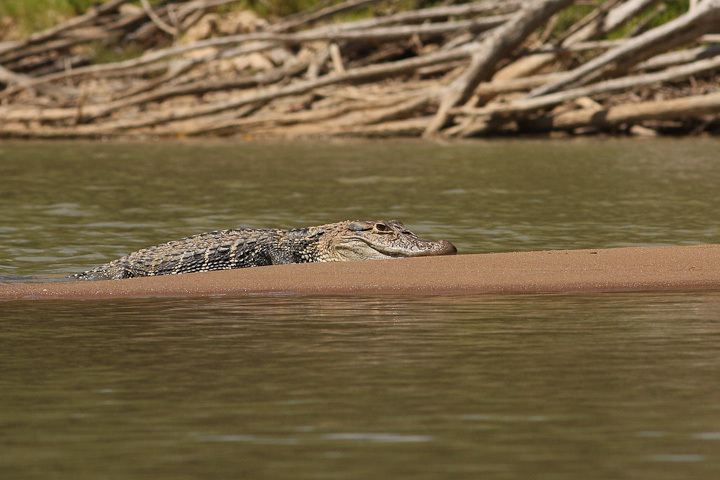 On the Rupununi and the lower Rewa, I was amazed at how many black caiman there were. Paleosuchus niger is the largest caiman, and in my mind I still thought of them as very rare. Conservation efforts and a reduction of hunting have caused a definite improvement for this beautiful species across their range. 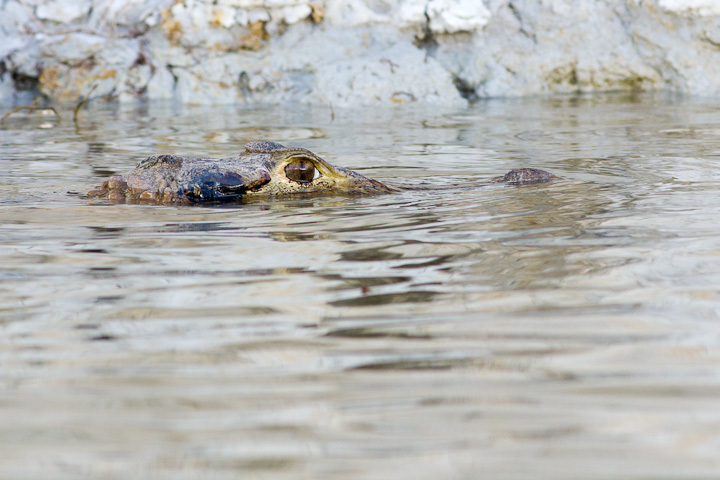 These large caiman can be dangerous, so while in their territory we made sure to bathe in shallow water where we could see them coming. With predators such as this, you are probably safe if you do not enter a good ambush zone, such as a place with a steep dropoff. 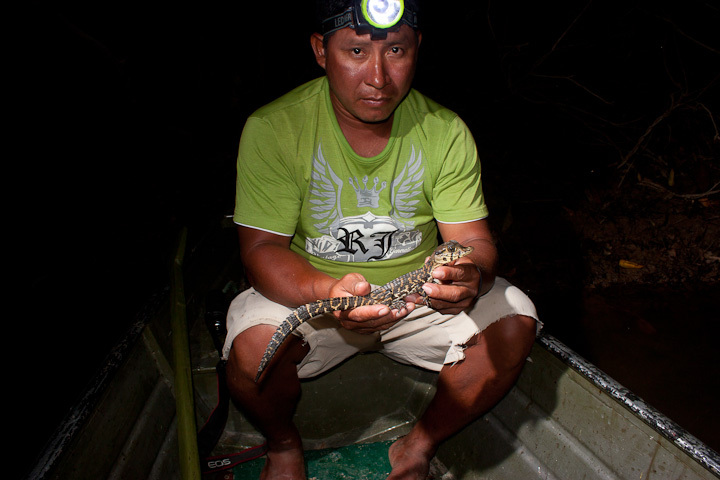 Rambo holds a baby black caiman, which we found in an aggregation near our camp one night. In Rambo’s hometown, Yupukari, there is a conservation and research outfit called Caiman House where the locals participate in monitoring and study of black caiman. Rambo has experience capturing, tracking and nest monitoring these impressive animals. 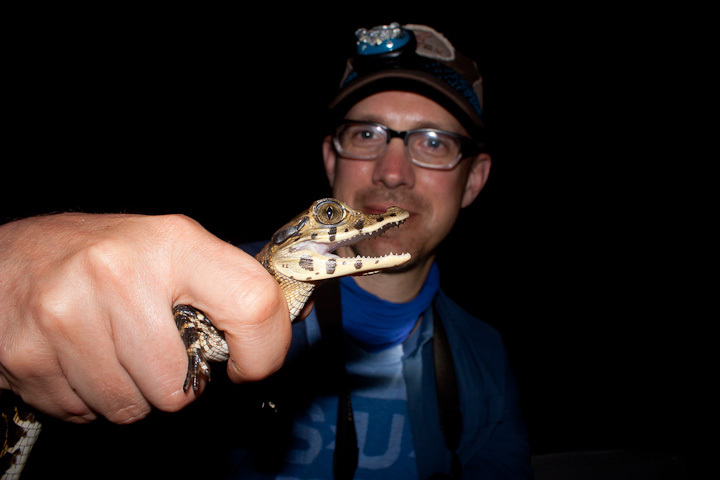 Jonathan posing with a beautiful little caiman. The babies tend to stick to protected “nursery” areas, as they are easy prey for birds and large fish. If you want a juvenile caiman to open its jaws, a little tickle on both sides of the base of the lower mandible will produce this posture. Above the major rapids, the Rewa is devoid of black caiman, and instead spectacled caiman and dwarf caiman abound. 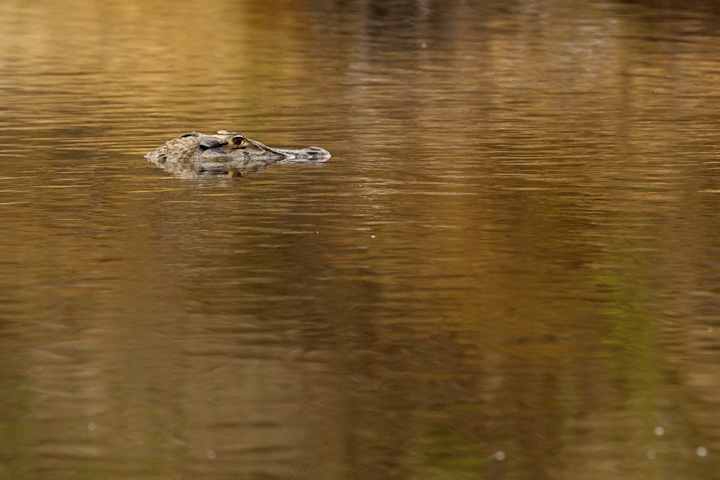 Here is a Schneider’s dwarf caiman cruising by our camp. I had seen Cuvier’s dwarf caiman in French Guiana (small ones living in small fast creeks), but seeing the adult Schneider’s was a revelation. These guys get fairly large, and inhabit even slow-moving sections of the river. 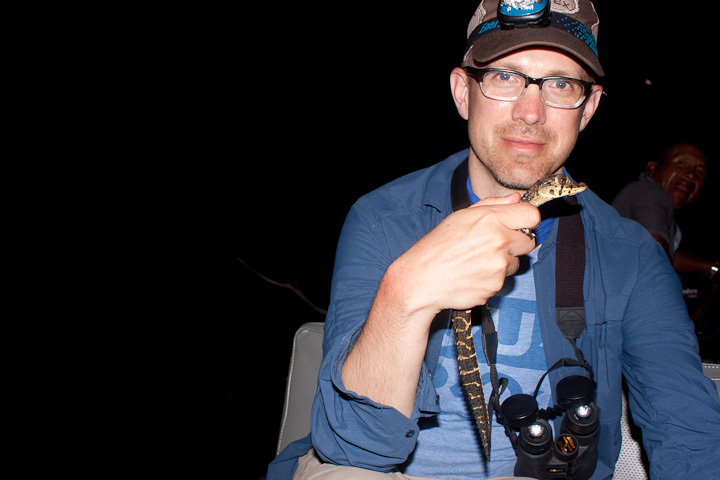 Brian tossed a piranha piece at this dwarf caiman, and it seemed to know exactly what was going on. It has probably seen several fishing groups upriver and has learned that when a boat pulls in, fish pieces from cleaning are often tossed out. This one had some fishing line attached, so we could try to haul the beast into shallower water. 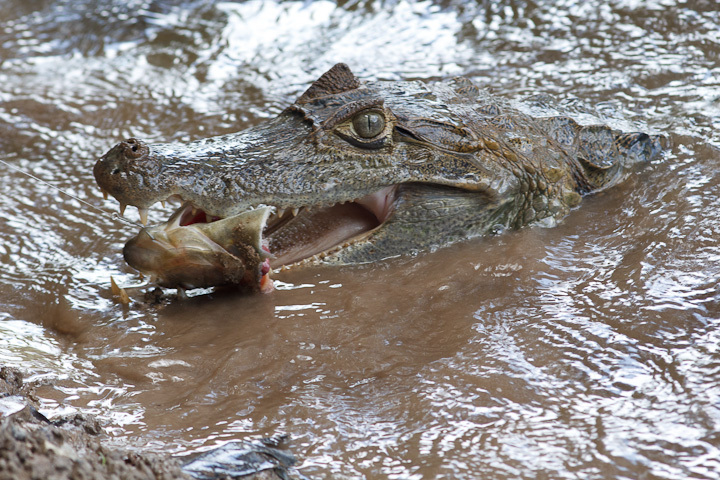 By the time the caiman got it’s feet planted, any further movement of the caiman was impossible! All of the crocodilians we met were quite shy, and even large black caiman would flee if we caught them in shallow water. This dwarf caiman was willing to come for tossed fish, but not if we were too close to the water’s edge. 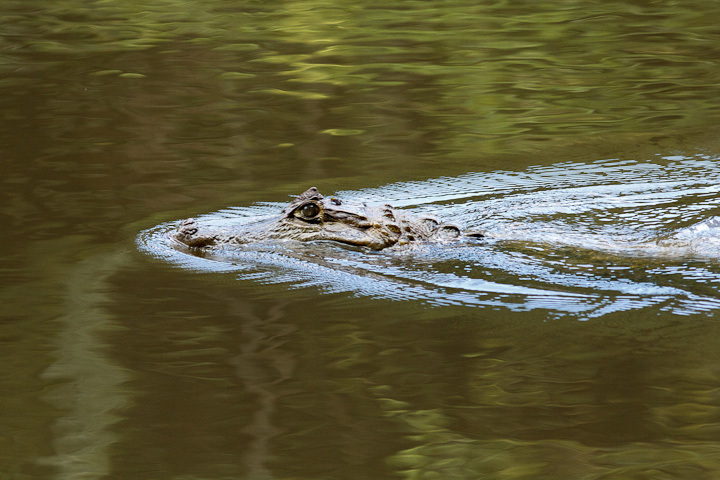 Some of the bolder caiman would stay on the bank as our boat passed, but most of them would flee for deep water. 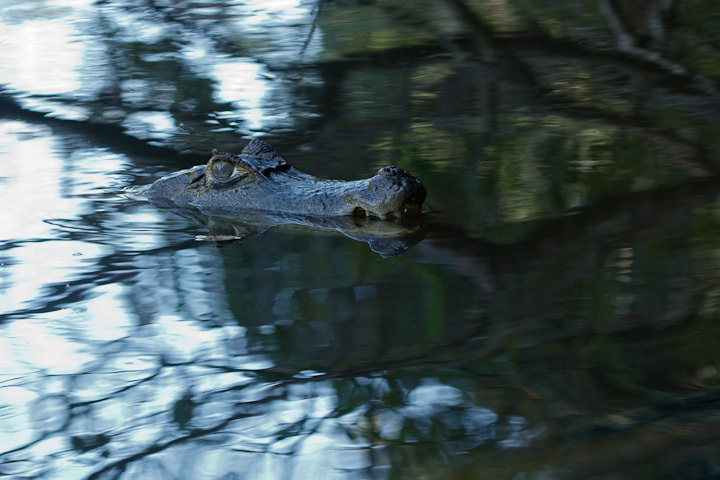 If you go out in the woods in the tropics, be sure to look out for the local crocodilians! They are fascinating and beautiful animals. This entry was posted on May 23, 2015, in Guyana and tagged Caiman, Crocodilians, Guyana, rainforest, Rewa River.